When it comes to real estate in New Mexico, many people shake their head at the thought of selling or buying a home. Not only can the market be confusing, but when many try to buy or sell on their own, they find themselves discouraged. If you are looking for a trustworthy Broker with experience and backed by a First-Class Brand, look no further than Berkshire Hathaway HomeServices Santa Fe. Being named as one of the largest real estate brands in New Mexico, our company provides service to Buyers and Sellers for All of New Mexico, the United States and other countries. Making your dream home possible. Because we are a part of Berkshire Hathaway HomeServices, we are able to offer more services than ever. As a growing company, we are excited about the future and what is in store. 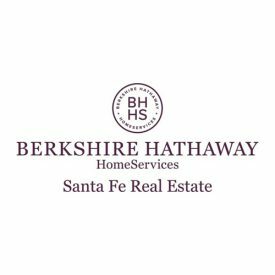 Combining knowledge and expertise, Berkshire Hathaway HomeServices Santa Fe offers all of our clients a unique, specialized service. Guiding you through the real estate market is absolutely essential because of how competitive the market is; with highly qualified Brokers on your side, you can trust your needs will be met. Whether you are looking to sell your existing property or you think you are ready to buy your first, Berkshire Hathaway HomeServices Santa Fe is ready to help you. In addition to residential buying and selling, we also offer commercial real estate assistance and relocation services.